If you’ve ever logged in to WHM as a root-level user, you’ve assuredly seen a box with a notification of a new or improved feature. This dialogue box is known as the “Feature Showcase,” and has allowed us at cPanel to present information about changes to cPanel & WHM. 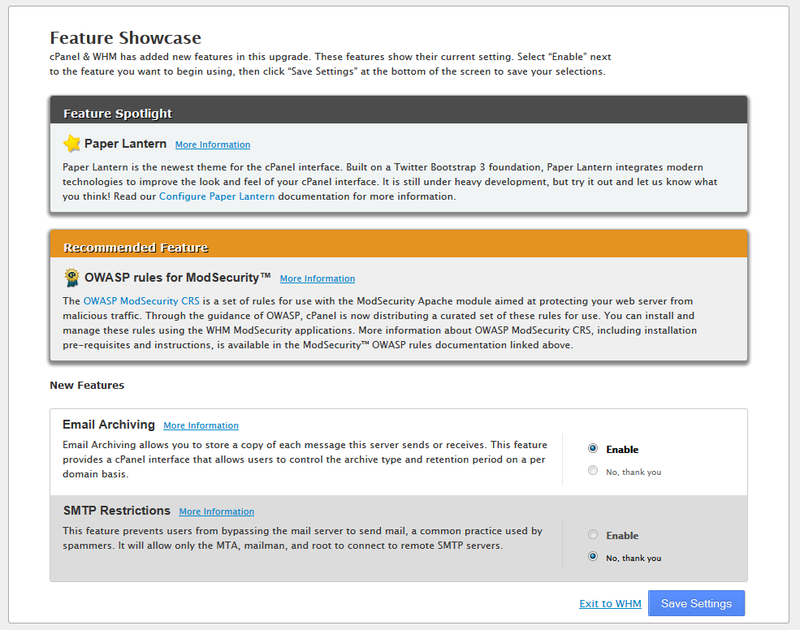 Since its creation, the Feature Showcase was only available for use by cPanel. However, we’ve made some changes to the functionality of the Feature Showcase which change that. Starting in v74, the Feature Showcase system now uses individual JSON files for each Showcase item. The update allows cPanel more control over how it appears and how configuration changes to the system are triggered. Now hosting providers and plugin developers can create notifications! The greatest benefit the new functionality of the Feature Showcase provides is opening the feature to third-parties. Hosting providers, plugin developers, and server owners can create their own Feature Showcase boxes in an officially supported way for the first time! This means that parties such as plugin developers can create new Feature Showcase popups upon the launch of a new feature in their plugin, or announce a change to an existing feature! This allows developers to create messaging that appears directly to WHM end-users in a way that doesn’t break the normal WHM workflow! So what comprises the Feature Showcase? Recommended Items Recommended items. cPanel & WHM usually enables these items by default, but not always. Announcements Announce a new feature. Announcement features cannot be enabled or disabled by a user, nor can a user configure any settings of the announced feature. Activation Announces a new feature where users are allowed to enable or disable the feature. Activation items do not allow a user to configure a setting. Configuration Announces a new feature where users can configure a setting of the feature. There are a few different actions you can request of a user who views the Feature Showcase item. manage a user submitted form field (handle_showcase_submission). enable and disable actions return a value of 1 for success and 0 for failure. set_default actions return a value of 0 for backward compatibility with Version 1.
handle_showcase_submission actions return the form response. To remove a Feature Showcase item from display simply remove the appropriate drivers.json file from the /user/local/cpanel/Cpanel/Config/ConfigObj/Driver directory. You should see something that resembles the following screen capture, with your new feature showcase item! It’s that easy! The uses for this are extremely exciting and allow our plugin developers a much deeper integration into the user experience. If you have any questions or comments about the Feature Showcase, feel free to open a ticket with our support team, or reach out to us via Slack, Discord, or the Official cPanel Subreddit.